As we close out summer and welcome fall, I must say some things never change. Like what exactly? Like the humidity (duh), heat and sunshine in sunny South Florida! It practically travels to every season with me. Sure, it’s great for the tan, but not so much the hair. My Florida girls get it. Which is why I’m (low key) excited to introduce a product line that’s great for any color/hair type today! I’ve mentioned them before in my IG Story Hair Q&As (yes, there’s a highlight)… I use an affordable brand for traveling as well as a slightly more luxurious brand, aka Moroccanoil, right after I color my hair. I mean, why not preserve the sense of confidence you gain from salon-fresh color? The great thing about the Color Continue Shampoo is that it’s sulfate-free; every time I washed my hair with it I knew my color wasn’t fading, but was continuously getting prepped to retain even more color. Same with the Color Continue Conditioner… both shielded my hair aka minimized color washouts! To me, it’s not about dying your hair more often throughout the year, but rather about washing and caring for your beautifully colored hair more effectively. (Hello! It’s an investment!) Whether a quick fix (highlights) or long term commitment (blonde or brunette? ), know that your mane deserves the best. 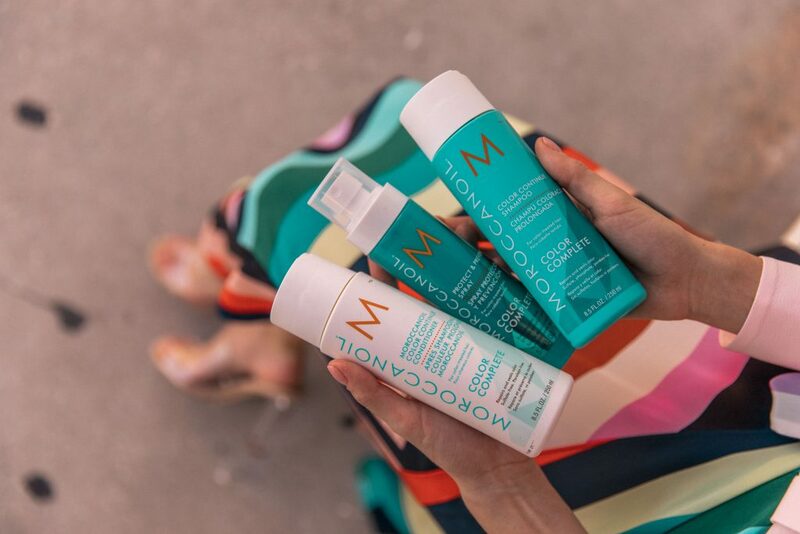 Learn more about Moroccanoil Color Complete Collection here. I love MoroccanOil! I actually met with them while I was in New York for Fashion Week. 🙂 Their products are amazing! That skirt is amazing – need to know details??? I love using MoroccanOil on my hair! They seriously have the best products and your hair always looks amazing! I love your style. Where is your skirt from!? Its gorgeous! I am dying over your outfit! Love love love! The rainbow skirt is so fun.